Create multiple choice questions and add feedback. Create multiple choice questions -- like quizzes -- that you can add to your lesson content. Often, discussion questions are subjective and there really isn’t a correct response. However, in some situations, you may have a question where you’d want students to choose a specific answer from given choices, such as grammar questions. A classic example would be if you’re telling students the different uses of words like affect and effect. To create a multiple choice question, you would add a 'Question Block' as you would a discussion question by clicking the 'Insert Question' button. Click the '+ Choice' button to convert to a multiple choice question. When completing the 'Question Block,' you can add optional feedback. If left blank, this will set to a default text. 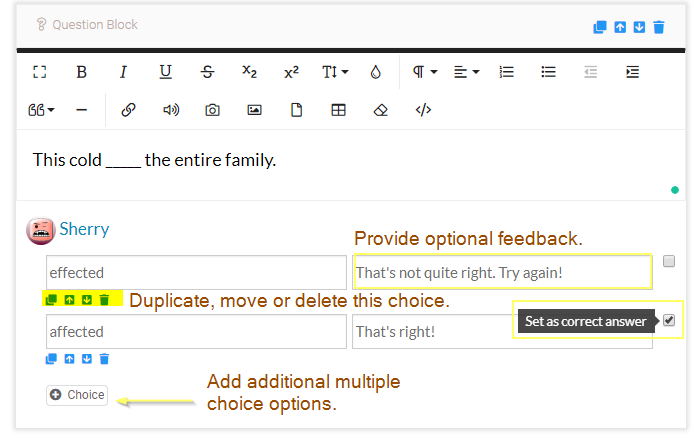 You can add or delete options, as well reorder or duplicate choices. you can also set a correct answer.